Leaked surveillance footage showed a man wearing Jamal Khashoggi’s clothes outside the Saudi Consulate shortly after Khashoggi disappeared inside it. It was apparently an effort to trick people into thinking Khashoggi left the consulate unharmed, though Saudi Arabia did not ultimately use the footage to bolster that claim. In an article published Wednesday, two Saudi officials told the Associated Press that Saudi agents brought in a body double ahead of time to pose as Khashoggi. They said, however, that the agents planned to detain Khashoggi and take him somewhere else for interrogation, not to kill him. They also offered a confusing rationale for why a forensics expert had been brought to the consulate. Turkey on Tuesday for the first time publicly characterised Khashoggi’s death as premeditated murder, a claim Saudi officials have denied. Saudi officials have acknowledged use of a body double to pose as the journalist Jamal Khashoggi, but they say it was part of a plan to kidnap rather than to kill him. 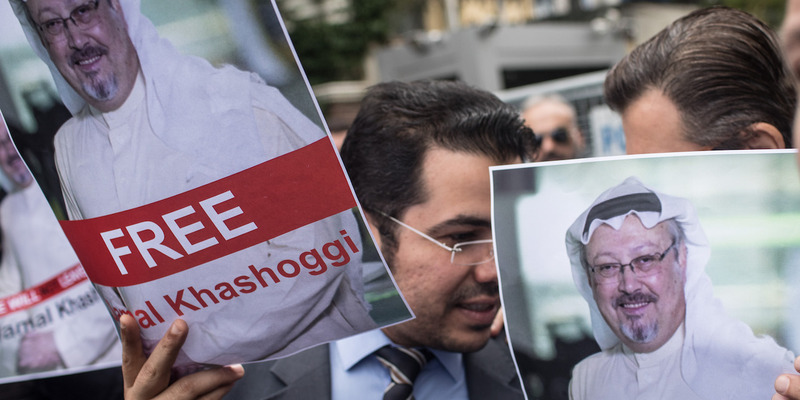 A man wearing Khashoggi’s clothes, a fake beard, and glasses, was filmed leaving the Saudi Consulate in Istanbul shortly after Khashoggi disappeared there. Officials initially did not address the existence of the double, whose deployment appeared to support claims that Saudi Arabia intended from the beginning to assassinate Khashoggi and then cover it up. But Saudi sources, speaking anonymously with the Associated Press in an article published Wednesday, claimed that the body double was not part of a murder plot but instead was meant to cover up a kidnapping. Chris McGrath/Getty ImagesPeople protesting Khashoggi’s disappearance outside the Saudi Consulate in Istanbul days after he was reported missing. “Asked why such a team would include a forensics expert and a body double, the Saudi officials said had the safe house option been used, the plan was for the forensic expert to wipe clean evidence that Khashoggi had been at the consulate and for the body double to leave the facility to give the false impression that Khashoggi had left on his own. “Instead, the two officials said, the operation with Khashoggi turned violent. They said that the team included a former Khashoggi colleague who advised him to return to the kingdom. When that failed, the writer, by their account, asked if he was going to be kidnapped. It’s not clear why the agents wanted to erase evidence of Khashoggi’s presence at the consulate if they also wanted to claim that Khashoggi entered the compound and left on his own. The two Saudi officials also told the AP that the Saudi agents who were inside the consulate panicked after Khashoggi died and disposed of the body with help from a Turkish “collaborator.” The officials did not confirm Turkish claims that the body was dismembered inside the consulate. Adel al-Jubeir, the Saudi foreign minister, told Fox News on Sunday that Khashoggi’s death was the result of a rogue operation unknown to the Saudi crown prince and intelligence agencies, though high-ranking Saudis were among the suspects in Khashoggi’s death. Turkish President Recep Tayyip Erdogan has demanded the whereabouts of Khashoggi’s body after weeks of orchestrated Turkish intelligence leaks claiming that Khashoggi was dismembered.